Butternut squash's versatility means it is simply beautiful roasted, like in this recipe, but can also be a great substitute for meat in a curry. It also makes a lovely soup ingredient. Clean off the stringy membrane from the seeds, wash the seeds in a sieve and dry using kitchen paper, lightly oil a flat baking sheet and spread the seeds on it. Spread the squash over a large baking tray, drizzle over the oil and bake for 35 mins or until tender. Bake the seeds for about 10 mins until they start to pop. Drain well, then stir in the cranberries and add some seasoning. Add the squash, seeds and squeeze over the lemon juice and serve. Butternut squash is beautiful simply roasted like in this recipe, although it can also be a great substitute for meat in a curry and it makes a beautiful soup. 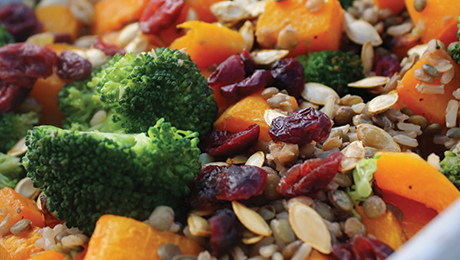 This recipe has a great natural protein base coming from the squash, broccoli and lentils and minimal carbs from the brown rice so is ideal meal for after a training session… it also fills a lunchbox very well for the next day’s smash and grab lunch.